Home Features West Ham v. Chelsea: What Did We Learn? West Ham v. Chelsea: What Did We Learn? Chelsea’s first trip to the new London Stadium didn’t go exactly as planned on Wednesday night, as the Blues were defeated by West Ham United 2-1. Gary Cahill’s goal with practically the last kick of the game halved the deficit for Chelsea, but if not for some wasted chances in front of goal, the match might not have been that close in the end. Chelsea manager Antonio Conte made seven changes, including restoring John Terry to the side after injury and handing starts to Ola Aina and Nathaniel Chalobah. West Ham made two changes, bringing in Aaron Cresswell after injury marred his start to the season and Darren Randolph in for Adrian in goal. Despite the changes, neither side played poorly. And an entertaining game of football saw the Hammers create the better chances despite the Blues having the bulk of the possession. 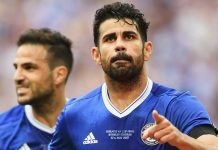 The late introduction of Eden Hazard, Diego Costa, and Pedro gave Chelsea a bit more impetus after going 2-0 down and chasing the game. Depth may be a problem for Chelsea going forward. Wednesday night’s EFL Cup match might prove to be a pivotal one this season. Antonio Conte made seven changes, and some of the players that started didn’t look to be comfortable or natural in a 3-4-3, leading to question what injuries could do to the squad. Conte replaced Diego Costa with Michy Batshuayi, and while the Belgian international showed a willingness to work hard, he lacked a bit of quality with both his movement and his technical ability, as well as not linking play effectively. That was underlined by the fact that most of Chelsea’s attacking play was initiated by Willian picking up the ball from deep and running at the back line, as opposed to Costa’s abilities as both an out-ball who can link play and can also run in behind. Chelsea’s wing backs on the night also failed to impress. Ola Aina looked okay at times in defence on the left, but also looked as if the pace of the match overwhelmed him, especially since Terry, playing as the left-sided centre back, looking unconvincing at times. Cesar Azpilicueta did an okay job on the right, but he lacked a bit of cutting edge in attack and his presence was sorely missed in the back three. Given the number of changes made and the change in the system, perhaps a little more time is needed for the entire squad to adapt. But on Wednesday’s evidence, it looks as if there might be a few players that aren’t a fit for a system that has looked good for the last few matches. Are John Terry’s days as a first-choice centre back numbered? Wednesday night was not a good night for the Chelsea captain. He looked off the pace at times and struggled to cope with the pace and movement of Dimitri Payet, Michail Antonio, and Manuel Lanzini. It’s understandable that there might be a little rust after six weeks off due to injury, but the fact that he was shifted around in the back three by Conte and the defence never looked balanced is a concern. The skills that make Terry one of the best defenders at Chelsea also don’t really seem a natural fit in a back three. His ability to read the game, organise, and provide a bit of calm and composure do fit the qualities of the central-most defender. The problem is that while he’s a great passer of the ball, he lacks the ability to dictate the play from the back in the same way that David Luiz is able, and when Chelsea struggled for control in the first half, Conte’s first move was to bring Luiz back to that central position. The problem with Luiz being first-choice centrally means that Terry has to play left or right in that system. Both of those roles require the defender to be comfortable in defending in wide areas when play gets behind the wing backs and also requires a bit of pace. Terry’s lack of pace in those areas is a liability, and West Ham looked to expose it on the counter for much of the second half by playing balls over and through the left channel between Terry and Luiz and every ball looked dangerous. Terry was given his one-year extension to his contract quite late, with Conte wanting to keep his leadership and his experience as part of the team. At the same time, he’s becoming the first manager to create a system that has shown some success without him and could mean that his playing time could dwindle even more. Despite being unheralded at the start of this season, Marcos Alonso and Victor Moses have become vital to this team. Wednesday night was a perfect example of why Conte’s 4-3-3 tends to work better with attacking players, often converted wingers, at wing back rather than converting full backs to that position. We saw it at the Euros this year. Alessandro Florenzi and Antonio Candreva are attacking midfielders, but Conte often deployed them on the right since their first instinct is to attack. With Aina and Azpilicueta in for Alonso and Moses, a bit of that attacking thrust was missing. Full backs natural first instinct is to defend, and Azpilicueta is not really effective going forward and Aina didn’t look to get forward enough. It resulted in Chelsea’s back three looking more like a back five and gave West Ham the advantage in midfield. With Alonso and Moses, you do get that attacking thrust, and more importantly, they offer width in the wide areas that allow the support players behind the striker to have a little more freedom to play inside. More telling is that the attack looked much better later in the match when Pedro came on and played in the left wing back position, though I don’t think that’s really a viable long-term solution, and it could be a placebo since the Blues were chasing the match. However, it’s an area that Conte may need to look at strengthening going forward considering the dearth of attacking full backs in our squad. Next articleAntonio Conte: Tactical genius?